There are only six flamingo species in the world, but they can be surprisingly easy to see for birders who want to add flamingos to their life list and know where to look for these wild birds. Non-birders can also get a glimpse of flamingos at a wide range of attractions that offer close views and unique opportunities without the need for extensive travel. In an attempt to see wild flamingos, it is essential to visit the proper habitats that support these wading birds. Flamingos are quite adaptable, and they can be found in a range of wet habitats from freshwater to saltwater, including mudflats, lakes, coastal lagoons, open marshes, and relatively shallow salt lakes. In many areas, flamingos can subsist in brackish water that does not offer enough food for other birds, and in those regions, large flocks are more common as flamingos gather in great numbers to take advantage of abundant food with little competition. When trying to build a life list, it is essential to see birds in the wild, in their natural habitat. Even with only a few flamingo species, it is possible for every birder to see at least one of these birds if they know where to look, and different flamingo species are found throughout the world. In the Caribbean: The American flamingo is native in the Caribbean, occurring on many islands. They are relatively easy to see in the Bahamas, Aruba, and Cuba, as well as along the coasts of other Caribbean islands and the adjacent coasts of Central and South America. Regular wild vagrants travel as far north as Florida and are often sighted in Everglades National Park or elsewhere in southern Florida. In South America: The Andean, puna, Chilean, and American flamingos are all residents in South America, and depending on the species they can be found in a variety of habitats from coastal marshes to mountain plateaus. Laguna Colorada in Bolivia is a popular spot to see flamingos, and wild populations are common in Argentina, northeastern Chile, and throughout Ecuador and Venezuela. In Africa: Both lesser and greater flamingos are found in large numbers in Africa. The most common breeding grounds are throughout the Great Rift Valley, including Lake Natron in Tanzania, Lake Bogoria National Park in Kenya, and Lake Nakuru, also in Kenya. 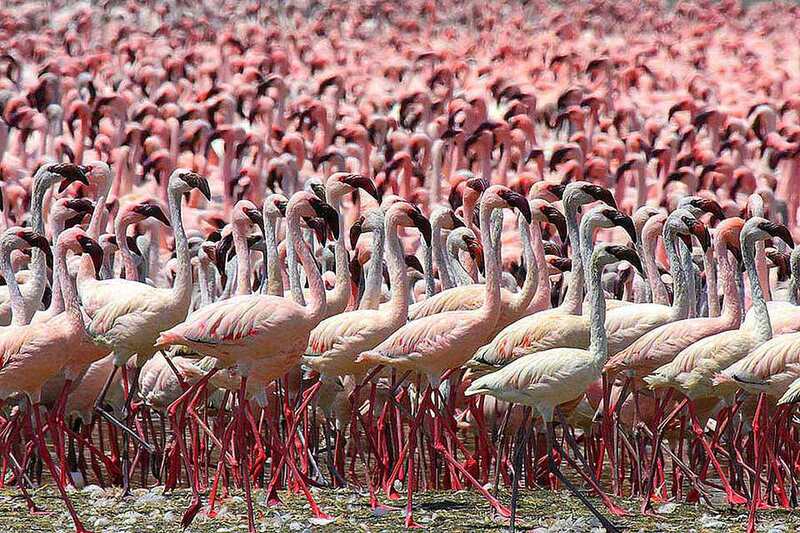 In these regions, thousands of flamingos can gather in tremendous flocks. In the Middle East: After the breeding season, greater and lesser flamingos regularly migrate to the Middle East, including areas of Pakistan, Saudi Arabia, Turkey, and Qatar. To a lesser extent, they can also be found in Iran and Kazakhstan, though their populations appear to be decreasing in those areas. Near the Mediterranean: Greater flamingos are regularly sighted along the southern Mediterranean Sea, spreading especially from Tunisia to Egypt and Israel in fairly large numbers. Rare vagrant sightings are often recorded much further north, but it is not certain if those birds are wild or escapees from captivity. Depending on the species of flamingo a birder wants to see, different birding tours are available to all of these regions of the world. Travel-savvy birders can also arrange their own vacations and getaways in flamingo-friendly areas. Near these types of locations, flamingos regularly escape and may be seen in the wild, where, if not recaptured, they may thrive for years in flocks with herons, ibises, and other wading birds. These lone birds, however, are not considered appropriate for a life list, but they can be quite a surprise far from flamingos' traditional ranges, and quite a treat for dedicated birders. Whether in the wild or in captivity, it can be amazing to see flamingos. By knowing what types of habitats these birds prefer and where in the world they are most numerous, all birders can find a way to add flamingos to their life list. Just How Unique Are Jacanidae Birds? Where Can You See Wild Penguins? Adopt a Penguin and Help Bird Conservation!